5 BR, 3 BA, Sleeps 10. Luxury 5 Bedroom / 3 Bathroom Pool Home at Hampton Lakes with Hot Tub, Games Room, WiFi and Free telephone calls. Our privately owned villa has 2 Queen size double beds with en-suite facilities, which is great for 2 families. The villa has 2,336 sq ft of living area in addition to an extended pool deck. 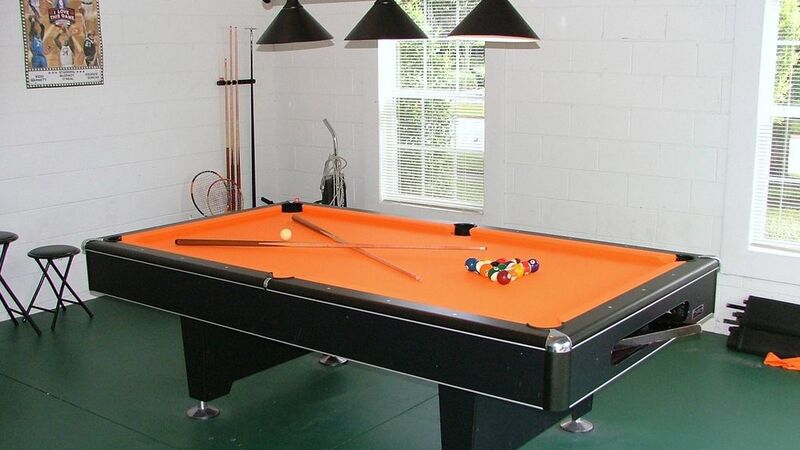 We also have a Games Room with a slate bed 8’ billiard table, Foosball table and a 7’ air hockey table. It is located in the prestigious Hampton Lakes development on Highway 27 and is perfectly located only 12 miles drive from the Disney Theme Parks. Restaurants & shops are only 5 minutes drive and there is a supermarket less than 2 miles away. Bedrooms – 2 Queen size double bedrooms with en-suites, TVs with Cable and DVD players, hairdryers, & radio alarms. There are a further 3 twin bedrooms upstairs sharing another a full bathroom. All linen and towels are provided. There is also a portable CD player & CDs. BR B Amenities: /B BR Air Conditioning, Heated Private Pool, TVs / DVDs, Pool Furniture, Double Garage, BBQ. Cooker, Microwave, Dishwasher, Fridge Freezer, Ice Maker, Waste Disposal, Toaster, Kettle, Coffee Maker. Washer, Dryer, Iron, Ironing Board, Hairdryers. BR B Area: /B BR The location is the perfect base for your Florida holiday. There are so many attractions in the Orlando area you will never be bored. Disney Parks, Universal Studios, Universal Islands of Adventure, Sea World, Kennedy Space Centre, Cocoa Beach, Busch Gardens, Airboat Rides, numerous quality golf courses, water parks, Fantasy of Flight air museum and not to mention the many factory outlet shops. Basically, something for all the family. We live in Scotland, UK and love Florida. We have been travelling to the Sunshine State for over 15 years and will be happy to help with any questions you have about our home or Orlando area in general. Hampton Lakes was our chosen resort because its well located close to both the US192 and the I4. Most important aspect for us was the Home Owners Association who ensure the estate is kept in great condition, looks tidy at all times and is secure. We picked our lot, which is 'oversized', and has lots of space all around. Its nice to have neighbors .... just not too close to us !!! Our pool is WNW facing. I know most people desire a south facing pool .... but you need some shade as well ! Our deck & pool gets a lot of sun most of the year & you can see this in our photos. However, you get some shade from the house too, which can be a relief. If we don't have it or if you are not sure, please ask. We may be able to add something or rent it for your trip. Gas BBQ available for $50 per week, including delivery & gas. Très agréable séjour!! Nous avons passé un 10 jours mémorables à Orlando dans votre maison! Très chaleureux et propre! La piscine était super! Very exquisite home! Loved it! This vacation home was the best choice we could have made. We made a last-minute decision being our previous rental fell through! This home was lovely & very tidy! It was a cozy & very comfortable rental. We felt very much at home. The home had everything you would expect to find at home especially the kitchen. It was practically fully equipped. The game room was cool. There were good reads, movies, and games for family to enjoy! The owners are amazing, sweet, & very reliable people. I truly enjoyed our talks. They made sure any concerns were taken care of. Overall this home has eased any fears concerning renting from homeaway. I would highly recommend this home. Exquisite pool & hot tub with everything your children may need to enjoy it. Best stay ever at a vacation rental home. House was big for my big family and the pool and hot tub was a plus. We never felt crowded in the house had everything we needed. The only thing was the upstairs bedrooms were hot. The owners has the AC on a timer 80/75and the house felt hot the first day. I called him and temperature drop to 78/ 73 The downstairs was not too bad therefore the kids slept downstairs. That was the only downside about the house.. I would really consider staying again next year if we can get the house temperature down. Oh also there was trash from previous renters right in front of the door when we arrived. It was the recycle bin it attracted all these bugs right in front of the house. My husband placed it on the side of the house. (No biggie) maybe that would be the people who clean the house might have just forgotten to move it. Thanks for the review. We've heard before that our photos don't always convey how big the home actually is! So glad our Manager was able to turn down the AC as soon as you called. Its set at constant temp and can be turned down / up as you require. Many thanks for your review and we are glad you liked our home. Hope to see you back again in the future. Hot tub was broken, dishwasher was clogged and unusable, ice machine didnt work, and large roaches on the upper level! Spoke to the owner and management company the first day we were there. They tild us the hottub was going to be fixed the next day. Someone did come out, but didnt fix the leak. I again reached out the owner and management company, but received zero response. We were there for a total of 12 days, and no one got back to us. We received zero assistance with the issues we had with the home. After we left, I sent one last email to the owner about the issues we had. I told him that I was trying to give him the opportunity to resolve and compensate us for our many inconveniences. That was a week ago. Owners wont even respond. This made our Christmas vacation far less than what we had hoped and expected. So disappointed. Renters beware! This owner apparently has no pride in the home and they deceived us terribly..... Worst vacation ever, and on Christmas !!!!! I very much regret we were unable to address your issues with our home during your stay. As explained to Jessica, the hot tub was brand new and we tried to have the supplier fix it under warranty but he was unable to repair the leak despite visiting on 21st and 23rd of Dec. I'm afraid this was something totally outside of our control. Our previous guests confirmed the dishwasher worked for their visit and it is now fixed (drain was clogged full of foodstuffs & pump had burned out). We have not claimed on your Security Deposit but the repair cost $175. Ice maker has also been repaired / replaced. Unfortunately, these things can't always be repaired next day ... especially over the festive holiday period when repairmen are on holiday. We always try to repair things as soon as they are advised to us, especially if they are going to cause any inconvenience during your stay. If you did send an email at the end of your stay I'm afraid it wasn't received and I'd request you to forward again. I really can assure you that we are very attentive owners / renters as all of our previous c100 guests will testify. We have invested a huge amount of our own time and over $20,000 upgrading our home in the past year and I am really disappointed you felt it wasn't PERFECT for your vacation. Our aim is to provide a fantastic home for everyone to enjoy, as photos & information on our website will show. 3rd visit to this villa, and once again very happy. The villa met our needs perfectly. An added bonus was the availability of the management company to resolve a couple of very minor problems.Thanks folks! Hampton Lakes in Davenport, Florida is a prestigious pool home development with great facilities, including tennis courts, volleyball court & a community swimming pool. The home is only 12 miles to the Disney Theme Parks so why not get up early and visit Mickey Mouse for a breakfast character dining experience to remember (and get into the park before everyone else at 8am)! There are supermarkets, restaurants & shops all within a 5 minute drive. Drive to the East coast or West coast within 60 minutes to see the fabulous beaches of Daytona or Tampa. Try out the many air boat rides or take a trip to the Everglades for a fantastic experience & see the real Florida! Get up close to the alligators & other wildlife. Our home is fully licensed for sales tax, insured and has many safety features for the kids .... pool safety fence, pool door alarm, monitored burglar alarm, monitored fire detection, safe, safety lighting & fire extinguishers. Don't compromise your own safety to save money!